When we are gone, we are nothing more than a collection of memories that others have of us. How we live, how we treat others, what we do, is how we will be remembered. In Mexico there is a saying, that we die three deaths. The third death, the most definitive death, is when there is no one left alive to remember us. Soft cover book with 172 glossy pages. Ships priority mail in the USA only for $10, which includes tax, handling and shipping, or you can pick it up free of charge at Florida CraftArt, while supplies last! 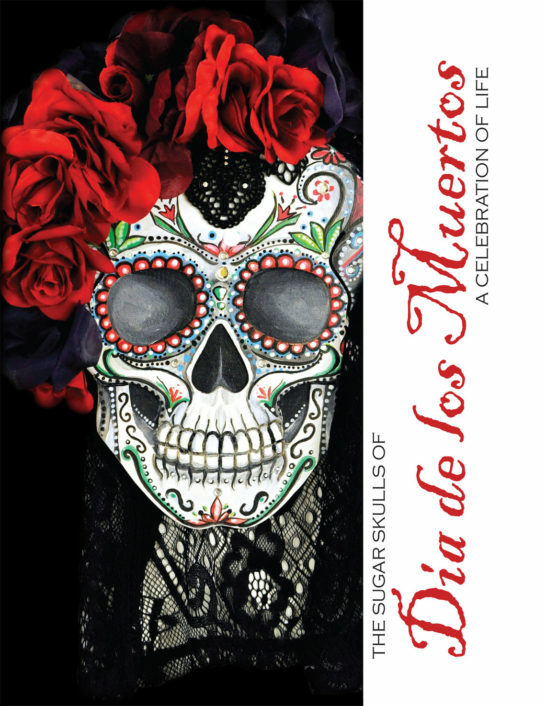 Sugar Skulls are an intrinsic part of the Mexican holiday Day of the Dead, so it seemed fitting that they should be included in the exhibition, “Dia de los Muertos: A Celebration of Life,” curated by Mark Noll at Florida CraftArt in St. Petersburg, Florida. Artists were invited to decorate plywood skull forms to raise some money for children’s art programming at the nonprofit organization. Sometimes simple ideas refuse to remain confined within their original scope and they take on a life of their own and grow into something not previously conceived. This book is the apotheosis of a simple idea. What started as a basic fundraising idea has grown into a marvelous collection of 160 Sugar Skulls and this book. This collection is as diverse in design as the artists who made them. Award-winning artists, students, stay-at-home moms, and even a Senior Field Service Engineer in charge of firefighting equipment training at airports, have produced these incredible creative designs. Word spread quickly about this project and artists from across the United States and Canada were eager to participate. Through each artist’s unique, personal vision the amazing works of art that are pictured in this book were created.